To sail on a ship during The Tall Ships Races is a once in a lifetime experience. Some of the ships sailing in The Tall Ships Races still have places for trainees – why not sign up and join them! As a sail trainee, you will meet young people from all over the world and be part of a team where you take care of each other facing all sorts of challenges, and weather. Experience the sea and the community on-board, and come home with new experiences and friendships. Wondering what life might be like on board? Then check out this video from race organiser Sail Training International. How can I become a trainee? You can book a place directly on your preferred sailing ship (if they have capacity). You will need to organise your own travel to and from the port of departure/arrival. An overview of the ships sailing to and from Stavanger in 2018 can be found here. You can sign up through Sail Training International´s Sail on Board-program and choose which ship you want to sail on. If you are unsure of which ship to choose, you can ask our international agent Windseeker who can assist you. They will suggest a ship to suit you and will contact and register you with the ship – and also send you all the information you will need before departure. City of Stavanger (Stavanger kommune) has its own trainee program for youth aged 15-25 years. This program is unfortunately already fully booked for 2018. Over 25 years? Although The Tall Ships Races are primarily for young people aged 15-25 yrs, there are also opportunities for those over 25 years of age. Please register choosing from points 1-3 above. There are several places you can apply for financing when taking part as a trainee (for youth 15-25 yrs old). See our information page for scholarship for trainees (in Norwegian only). NB! This program is fully booked for 2018. Are you between 15 and 25 years of age and would you like to join our partner program? Apply for a subsidized place directly to us via the link below. FULLY SUBSCRIBED FOR 2018! Who can join as a trainee? Everyone can join the sail training programme, without any prior sailing experience as long as they are in normal good health. The sail training programme is intended for ages 15-25 in particular, but it is possible to apply directly to the ships for a place as a trainee, should you be over the age of 25. Sail Training International has information about other trainee programs on their Sail on Board website. When and where can I sail? In 2018, The Tall Ships Races sail in the North Sea and you can sign up for one of the following legs: Esbjerg, Denmark to Stavanger (20.– 28 July) or Stavanger – Harlingen, The Netherlands (29 July – 5 August). 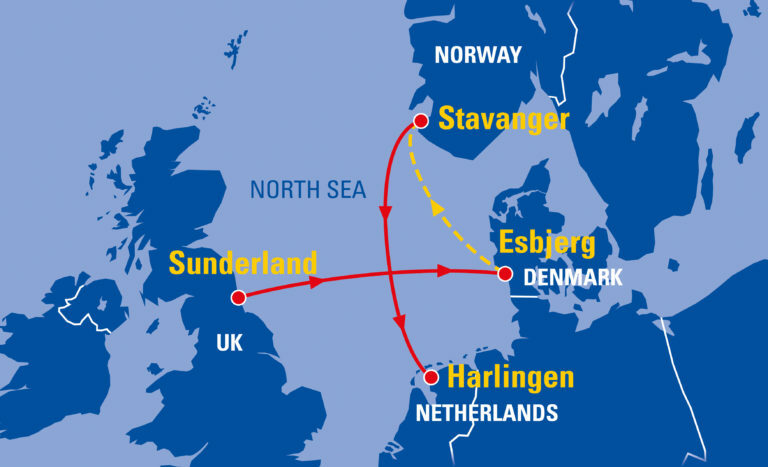 A total of 7 days, 5 at sea and 2 in the host port (plus one night in Esbjerg 20-21 July prior to departure). 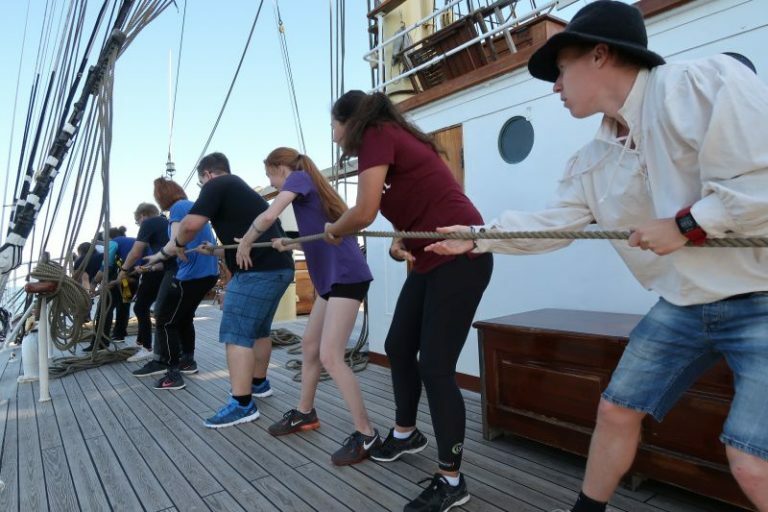 The Tall Ships Races is primarily about teaching young people aged 15-25 to sail amicably together, regardless of nationality, culture, religion, gender or social background. Stavanger aims to send young people from the Rogaland county sailing on tall ships during the 2017 and 2018 Tall Ships Races. In 2017, Stavanger sent 50 youths sailing with the beautiful tall ships.